We, Manglam Build Developers Private Limited, recognize the importance of protecting the privacy and the rights of individuals in relation to their personal information. This is a testimony to how serious we are with your information and that your information remains private. Following is how we collect and manage your personal information. In general terms, “personal information” is any information that could be used to identify you personally. This may, and not necessarily an exhaustive list, include your name, address, telephone number, email address and profession/occupation. If the information that is collected by us personally identifies you, or you are reasonably identifiable from it, the information will be considered personal information. 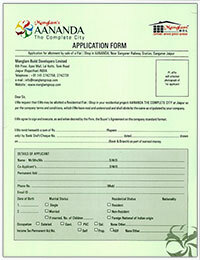 We may collect your name, mailing address, email address, telephone number, gender, profession/occupation or identification details and any additional information relating to you that you provide to us directly through our website or indirectly through your presence on our website or through our representatives or otherwise and information you provide to us through our service centre, customer surveys or visits by our representatives from time to time. If you are unsatisfied with any of the above, you are requested to write to us and notify us regarding the same.